Martha Stelter (‘19) competing at the Luther open on Nov. 16-17. The Luther Women’s and Men’s Swim and Dive teams hosted the 2018 Luther Invitational on Nov. 16-17. 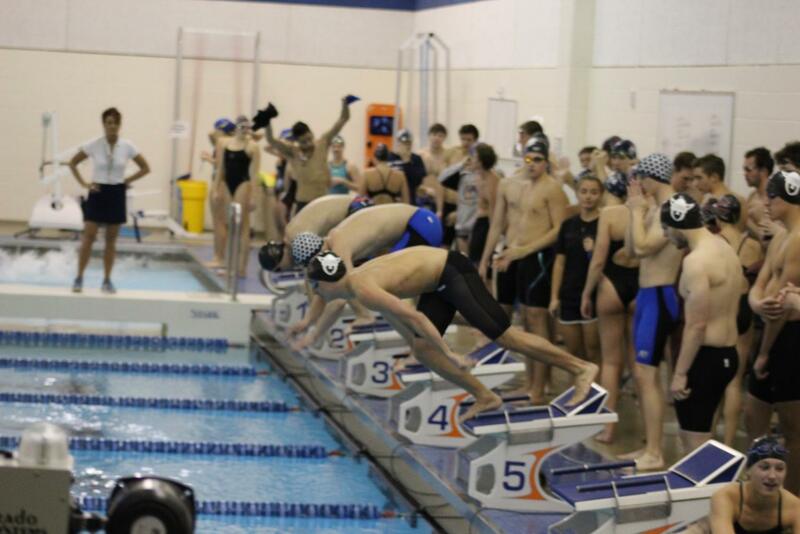 In total, the meet held 13 individual events, five relays, and two dive events. Each competitor could swim up to three individual events and four relays. The 2018 Luther Invitational included Iowa Lakes Community College, St. Ambrose University, St. Mary’s University, and the University of Wisconsin-La Crosse. The Women’s team finished first out of five teams. Linnea Lee-Brown (‘21) was the top finisher in all three of her individual events: the 50 yard freestyle with a finishing time of 24.74, the 100 yard butterfly with a finishing time of 1:00.42, and the 100 yard freestyle with a finishing time of 53.52. The 400 yard medley, including Lee-Brown, Elena Dooley (‘19), Lilly Anderson (‘22), and Martha Stelter (‘19), finished first with a time of 4:17.55. Emma Shumate (‘22), also took first in the 100 yard breaststroke with a time of 1:09.96. 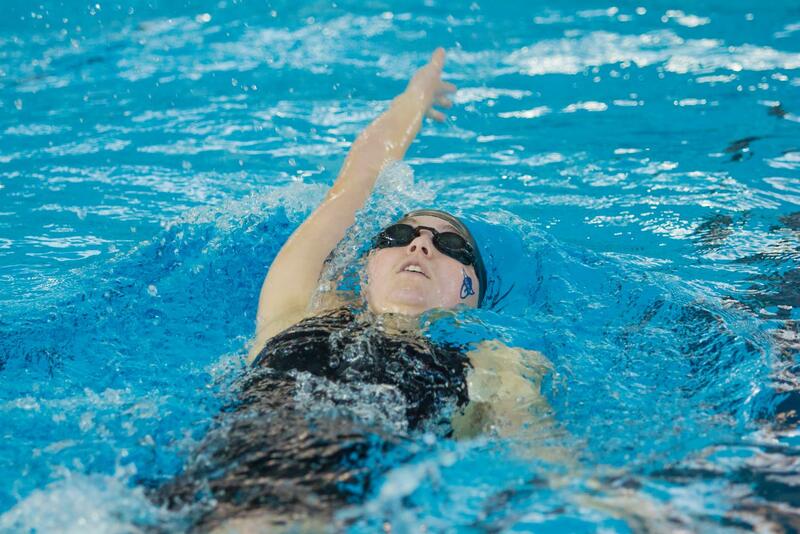 Jessica Olson (‘21) swimming the backstroke during the 800 yard Freestyle Relay on Nov. 17. Luther finished third in this event in a time of 8:51.53. The Men’s team finished third out of five teams. EJ Kohner (‘19) placed first in the 50 yard freestyle with a time of 21.68 and the 100 yard freestyle with a time of 47.99. Kohner was also a part of the winning 400 yard medley, which included Matt Benson (‘22), Jackson Gergen (‘22), and Kyle Anderson (‘21) finishing with a time of 3:44.08. This meet falls right in the middle of the season, as practices continue to build for the championship meet in February. Both teams have already had six meets since practice began on Sept. 24. Head Men’s and Women’s Swim and Dive Coach Nicole Kaupp hoped that everyone could post season best times, as the swimmers are tapering. “This is our first chance to swim fully prepared for races, meaning that we haven’t lifted in a week, practices have been a little bit lighter, so they’re not necessarily as broken down as they have been in other meets, and we should see some pretty fast times,” Kaupp said. Matt Benson (‘19) starts for Luther in the Men’s 400 Yard Medley Relay on Nov. 17. Luther won this event in a time of 3:44.08. In order to resemble the conference meet in February, the two days of the invitational were split into three swimming sessions with diving events in between the sessions. Swimmers competed in the events they specifically trained for because they are not always racing in their respective event at every meet. Many swimmers, including Stelter and Tristan Niemeyer (‘21), wanted to improve their times for this meet going into conference. The invitational was not the meet to strive for a personal best, according to Niemeyer, but to get a season best time. “This meet is really good for improving your seed times at conference, so it’s like your best time going in,” Stelter said. Goals differed per swimmer and personal bests were tracked more individually, but Kaupp estimates that the team earned at least 15 personal bests. Gabrielle Blair (‘19) thinks that the team’s encouragement of each other sets them apart. Everyone had different goals coming into this meet that will continue to propel them through the rest of their season. Blair’s goal reflected what Kaupp shared as her goal for this meet: a sense of where the team is for the season and what to work on to see further improvement.